The piano accordion was my first instrument. I hated the instrument, and I wasn't too crazy about my teacher. I started piano lessons at the age of 9, but I didn't have a piano to practise on. My late Dad drove me to the church hall every evening to practise. You can imagine my excitement when one morning before school, a truck pulled up on the driveway, and out came two movers carrying a piano. The rest is history you could say, except for the time I rebelled a little about having to practise and do exams. Long story short, the examiner wrote on my Grade 4 Piano exam result sheet, "Nails too long!" Just in case you're wondering, I did very quickly come to appreciate my piano accordion beginnings. 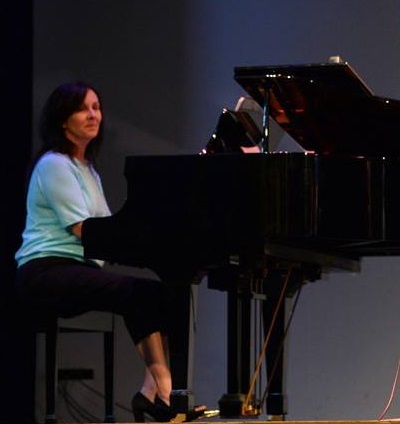 I gave my first piano lesson when I was 16 years old, so my piano teaching career spans more than 36 years. I also have 15 years experience as a classroom music teacher in both primary and secondary schools. I love playing in many different styles, but my passion is black gospel piano. It is a style that moves my insides like no other music. Since I have been sharing this music with others, I have noticed that many people appreciate and are enthused by it too. Master of Music (MMus) - Black Gospel at the Keyboard (Piano Performance); Bachelor of Learning Management (BLM) (Secondary/Graduate Entry); Bachelor of Music/Performing Arts (BMus/Perf.Arts) (Piano Performance); and, Licentiate Trinity College Music London (LTCL). I am currently a confirmed Doctoral Candidate (Doctor of Musical Arts [DMA]) with Griffith University, Queensland Conservatorium.